Home > Used Vehicles > 2014 Scion FR-S VERY CLEAN SPORTS CAR, AIR,TILT,CRUISE,PW,PL,LOW KMS, LOCAL TRADE!!!! 2014 Scion FR-S VERY CLEAN SPORTS CAR, AIR,TILT,CRUISE,PW,PL,LOW KMS, LOCAL TRADE!!!! Hot Deal! We've marked this unit down $2938 from its regular price of $18900. 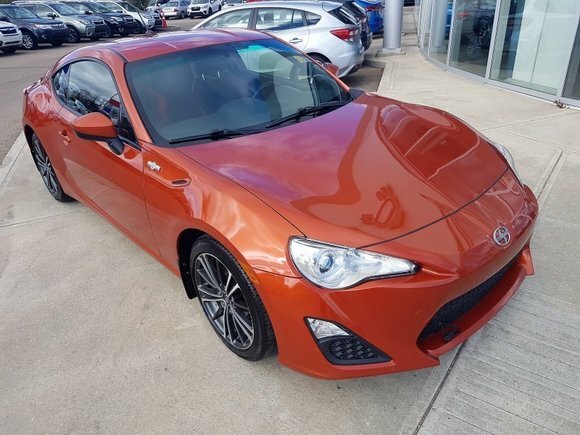 This 2014 Scion FR-S is for sale today in Edmonton. The Scion FR-S is an affordable sports car that awakens your inner driving enthusiast. This rear-wheel drive coupe has incredible driving dynamics, an excellent chassis, and racy styling to match its performance. It even comes with a measure of practicality with a back seat and a fairly spacious trunk. Treat yourself to the fun, affordable Scion FR-S. This coupe has 49250 kms. It's firestorm in colour. It has an automatic transmission and is powered by a 2.0L H4 16V PDI DOHC engine. Buy this vehicle now for the lowest bi-weekly payment of $120.92 with $1759 down for 72 months @ 5.99% APR O.A.C. ( taxes included, $790 Administration and Secure Ride included / Total cost of borrowing $3033 ). See dealer for details. Want to try the 2014 Scion FR-S VERY CLEAN SPORTS CAR?